Mitt Romney picked Paul Ryan as his running mate today. Mitt announced his pick early this morning. 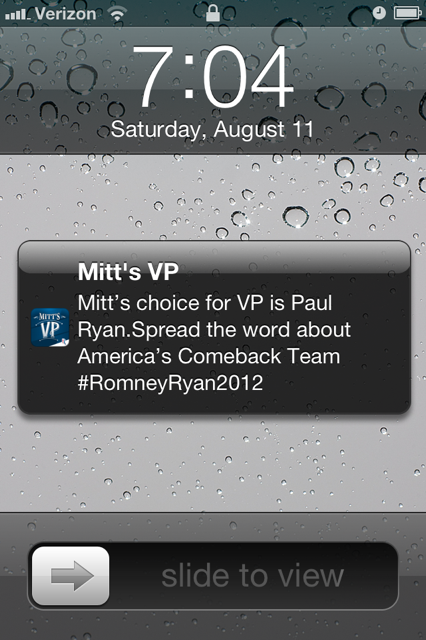 Here is a screen grab of the notification sent from Mitt's VP app to all who downloaded. Mitt Romney picked Rep. Paul Ryan (R-WI) as his running mate today. Republican presidential candidate Mitt Romney has picked Congressman Paul Ryan as his vice presidential running mate, the Romney campaign confirmed on Saturday. 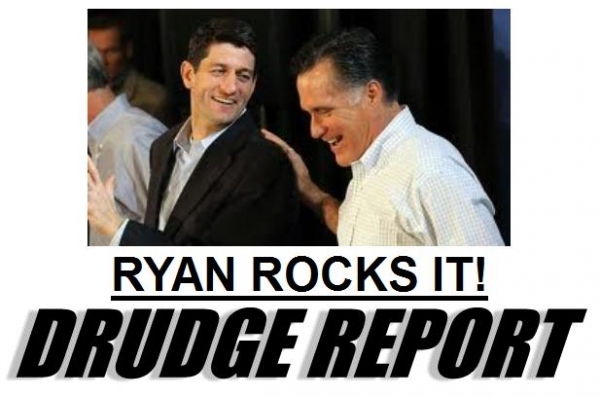 "Mitt's choice for VP is Paul Ryan. Spread the word about America's comeback team," a Romney campaign app said, confirming widespread reports he had selected the 42-year-old Wisconsin lawmaker who chairs the U.S. House of Representatives Budget Committee. Romney was expected to introduce Ryan at the retired battleship USS Wisconsin - coincidentally named for Ryan's home state - in Norfolk, Virginia, at about 9 a.m. EDT (1300 GMT) Saturday, a Republican official who asked not to be identified said late Friday. The announcement will mark the end a months-long search by Romney for a running mate to join him in facing Democratic President Barack Obama and Vice President Joe Biden in the November 6 election. Romney starts a bus tour on Saturday through four politically divided states that he needs to win in November: Virginia, North Carolina, Florida and Ohio. The choice was made on August 3rd. Ryan has flaws of course, but I think this is a clear attempt to bring the Tea Party on board. Ryan got his start at Empower America in the 1990s, which became FreedomWorks in 2003. I worked with Paul on the House Budget Committee under Kasich. He was associate staff for Sam Brownback, now gov. Of Kansas. If you and I don’t show up and defend Paul Ryan, expect our best ideas to lose in the political marketplace. The grassroots must now unite around Ryan who is known as a reformer. Given the options, we could not have done better. Welcome to presidential politics. Why isn't FreedomWorks promoting Ron Paul? He's a MUCH better candidate than Romney, and the Republican Convention hasn't been held yet. I don't understand the support for Romney, when the man has a horrible record for everything the Tea Party stands for. Now he needs to nominate Ron Paul Fed chairman,Allen West Sec. of Defense,Michelle Bachman Homeland Security Administation,Herman Cain Treasury Sec,Then continue naming everyone who ran against him in the primary to a cabinet position.The Left would not know how to react and the media would self destruct.That would be fun to watch.